25% off fabric purchases only, Thursday - Saturday. Becky and Leann returned from Spring Market last week. we hope everyone will be excited about. will slowly come in throughout the summer. Row by Row starts June 21. For Row by Row Jr, it works similar to regular Row by Row. they receive a free Jr. pattern. and the pattern will be in the kit. to receive a special certificate and ribbon. 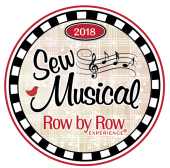 Row by Row goes from June 21-September 4 this year. Faye Medina is well enough to return. New Tilda fabric from Norway! Becky previewed much of it on Facebook. coupons on your birth date!